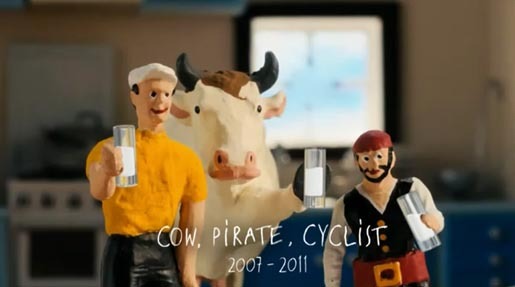 British milk company Cravendale has drawn to a close the Cow, Pirate and Cyclist advertising campaign featuring animation by Belgian team Pic Pic and Andre. The campaign, online at milkmatters.co.uk and Cravendale Facebook page, finishes with one final television advert paying tribute to the trio’s escapades. The Cravendale Milk Matters campaign was developed in 2007 at Wieden + Kennedy, London, by creative directors Ben Walker and Matt Gooden, art director Frank Ginger, copywriter Sam Heath, and producer Helen Whiteley. See comments on the campaign at W+K London’s blog. Animation was directed by A Town Called Panic team Pic Pic and Andre (Vincent Patar and Stéphane Aubier) via Nexus Productions. Post production was done at La Parti, who also worked on A Town Called Panic. Editing and sound design was done at Alea Jacta. Online editing and grade work was done at Ace Image Factory (Belgium) and The Mill (London).